The sequel to Dragons Lost and Dragons Reborn is here. Requiem is lost. The marble halls, the old books, the very magic of the kingdom--a kingdom of people who could become dragons--are all but forgotten. Now there is only the Cured Temple, a fanatical cult ruling a land called the Commonwealth. Yet for the first time in a hundred years, dragons are flying again. There are only several dragons left in the world. Only several souls against an empire. The Cured Temple commands vast armies. Its paladins swarm across the land. Its warships fill the seas. And now the Temple raises its greatest champions yet: the animated skeletons of long-buried dragons, undead beasts that fill the sky. 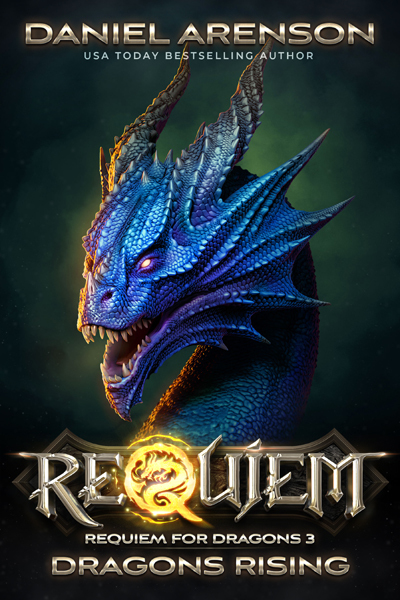 Facing these hosts, the last dragons of Requiem have but a flicker of hope, the sliver of a dream. But these last dragons rise nonetheless. They fly to war. They fly with one cry, one vision, one prayer: "Requiem."